Have you ever wondered how to create that beautiful Christmas tree, the kind featured in photo shoots and magazines? Whether you opt for a live potted tree, a fresh cut pine or an artificial tree you can reuse for several years, the steps to a stunning, artistic tree are the same, and you don’t have to be an interior designer to create a lovely Christmas tree. Pick a theme color or color pair. This may be colors you simply like together, or you could mimic school colors, a favorite sports team or classic holiday pairings like burgundy and gold or blue and silver. Consider your tree theme and choose colors accordingly, such as blue and aqua for a tropical, undersea tree, or white and silver for a winter wonderland tree. Use one strand of 70 to 100 lights for each foot of tree (7 strands for a 7-foot tree). This will be the approximate ratio on a pre-lit artificial tree, or you will need to add lights to a live tree. Spread the strands out evenly, and tuck wires into the tree so they are less visible. White lights or a single color are generally more elegant than multi-colored strands. Plan on 40 to 60 yards of ribbon unless the tree is in a corner. The treetop will typically take 10-15 yards of this amount. You can also mix two ribbons for a nice effect, too. Wire-edged ribbon is easier to shape into graceful curves, and a broad ribbon will make a more dramatic impact, particularly on a larger tree. Drape the trailing edges of ribbon down the sides of the tree, either straight toward the ground or in a graceful spiral. Add silk or dried flowers as your next step along with garland. Make sure flowers are placed at different depths within the tree so there is dimension. Holiday flowers such as poinsettias are most popular, but you can opt for different blooms to coordinate with your theme, such as roses for a Victorian tree or tropical flowers for a festive beach-themed tree. Use 6-8 boxes of plain glass ball ornaments, either all the same color or 3-4 boxes each of two coordinating colors. Tuck some of these ornaments deeper within the tree to reflect more light and add depth to your decorating. 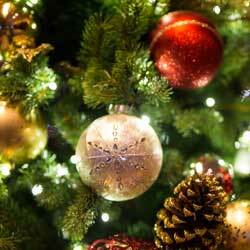 A medium-size ornament is appropriate, or choose balls of different sizes but in the same plain color and basic shape. Add themed ornaments last for that finishing touch and to give your tree some whimsy and pizzazz, but try not to go overboard with quirkiness. If you prefer a simpler, more elegant look, avoid overly themed ornaments but choose simple colored ornaments in different shapes that match your overall color plan, such as using drip, icicle, or star-shaped ornaments to complete the tree. Voila! You have a Christmas tree that will bring beauty and elegance to your holiday decorating all season long.